EU Regulation 1143/2014 the Invasive Alien Species (Enforcement and Permitting) Order 2019 will come into force on 28 March 2019, a day before the UK is scheduled to leave the EU. This Regulation will prevent the keeping and release of non-indigenous ‘Alien Species’ such as grey squirrels and muntjac deer. At present Natural England issues licences to allow for these animals to be kept and released in areas of England where they pose no threat to native species. This system has worked well for many years. Most large wildlife rescue centres in the south of England are licensed to treat and release, once healthy, set numbers of these animals, many of which are orphans, rescued by concerned members of the public. At the end of March however, under the new EU system, all rescue centres and veterinary surgeons in the UK will be required to euthanise animals bought to them. The result will be that any member of the public who finds a grey squirrel, muntjac deer or other ‘alien species’ and takes it to a centre will either be turned away, or the animal will be euthanised, no matter how healthy it is. • They are detrimental to the welfare of established British wildlife and animals will suffer unnecessarily. 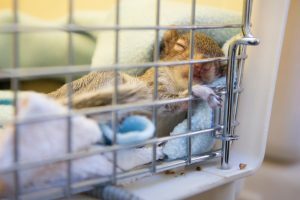 • The policy will drive the treatment and rehabilitation of grey squirrels and other non-indigenous species underground, forcing amateur animal-lovers to keep the animals themselves, rather than risk them being euthanised. Consequently, there is a real risk to animal welfare. • The policy will have no impact on populations of non-indigenous species, as the number of animals released under the current licensing system are insignificant in terms of overall numbers. • The policy will create public disaffection at a time when wildlife needs to be protected, not persecuted. In just a few weeks in December 2018, over 20,000 people had signed a petition opposing the regulations. • Enforcement of the regulations will be a waste of public resources. The current licencing system works well and should be continued. Signatories: Simon Cowell, Founder and CEO, The Wildlife Aid Foundation. Louisa Cowell, Deputy CEO, The Wildlife Aid Foundation. Pauline Kidner, Founder and Advisor, Secret World Wildlife Rescue. Lesley Browne, CEO, Secret World Wildlife Rescue. Elizabeth Mullineaux, BVM&S, DVM&S, CertSHP, MRCVS, RCVS Recognised Specialist in Wildlife Medicine (Mammalian). Richard Edwards MRCVS, Director, AlphaPet Veterinary Clinics. Natalia Doran, Founder, Urban Squirrels. Dave Risley, Director, The Folly Wildlife Rescue Trust. Sue Schwar, Founder, South Essex Wildlife Hospital. Caroline Gould, Founder, Vale Wildlife Hospital.